I went down the increasingly muddy garden to put some stuff on the compost heap. 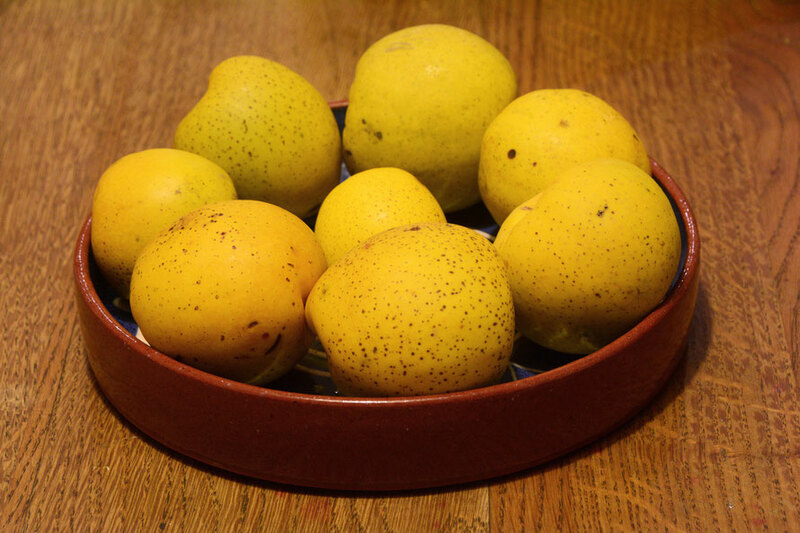 On the way back I noticed that the quince that had fallen in the autumn were glowing beneath the quince bush. I picked them up and they were still as hard as golf balls. So I brought them in and washed them and took some photos of them in the dish we brought back from Rajasthan. The lighting was terrible - just an ordinary bulb directly overhead. But I did a proper white balance test (a first) and created a pre-set to inform the white balance. I was terribly impressed with myself. The photo above is the best of the bunch in my judgement. Nothing was automatic and I just adjusted the brightness manually - auto-levels just bled too much red out of the colour (the histograms for red, green and blue were really very different). I then added a deep red filter effect as a last touch. This was necessary to combat the greening of the quince yellows. Tripod, centre-weighted focus, f16, 1/6, ISO 1000. The file here is 558KB at 72ppi.